You've decided to have a Christmas Budget this year, great! 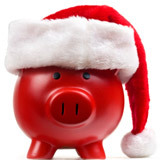 Having a Christmas budget means less stress and bigger savings for you. Here are some budget ideas to think about when designing your Christmas budget. Think of what categories you will need to have in your budget. Now that you have your budget categories, you need to put in allotted $ dollar/£ pound amounts for each category. You can do this by using the amount that you have in your Christmas Fund if you have one. If you know for sure that you are receiving a Christmas bonus than you can use the amount. Once you have assigned a amount to each category it is important that you keep a tally of how much is spent so that you have a good running total of not only the amount left in each category but what the total amount is for the entire Christmas budget at any given time. Be realistic when it comes to assigning dollar amounts to the categories. You may wish to look at your spending for past years in each category, take into consideration the cost of living increase for the current year to arrive at a decent estimate for each category. If you keep a cheque register and pay for most items using cheques then you have a handy reference tool to use for determining amounts. When it comes to buying gifts or planning the holiday meal, be sure to check your budget to see just how much you can spend for this particular item. Actually put the amount on the shopping list (in the corner) to remind you of what your budget is, and stick to it. Do not be tempted to overspend no matter how tempting a store item may seem, stick to your budget.